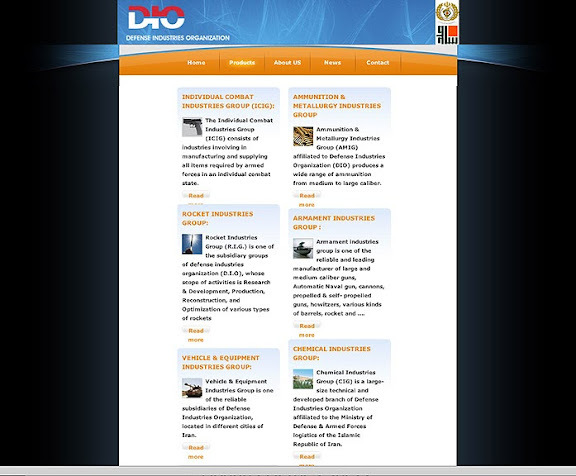 New updated website for Iran's "Defense Industries Organization" (DIOMIL) accessible by clicking above image, or by clicking HERE. Iran has the largest and best military industrial complex in the region. Iranian weaponry has been battle tested and is easy to maintian. Janes Defence Weekly in today's edition has detailed Iranian progress and expansion of missile forces including large underground bases and silos for second strike. AFP - Iran has developed a second rocket-launching facility which will likely be used to test ballistic missiles, a London-based defence analysis group said Thursday. IHS Jane's said it had pinpointed the site outside the city of Shahrud, around 350 kilometres (220 miles) east of Tehran, near the Caspian Sea and the Turkmenistan border. By analysing satellite imagery, Jane's said that construction began at the site between May and September 2010 -- around the same time as the expansion of Iran's existing launchpad in Semnan. "Satellite imagery analysed by IHS Jane's has revealed a previously undisclosed Iranian rocket launching facility near the city of Shahrud in northeastern Iran," said Matthew Clements, editor at IHS Jane's Military and Security Assessments Centre. "Imagery analysis of the Shahrud site suggests it will be a strategic facility used to test ballistic missiles, leaving the other two sites free to handle Iran's ambitious programme of satellite launches." The site is around 40 kilometres (25 miles) southeast of Shahrud. By August 2011, a major construction project was under way, covering approximately 100 square kilometres (40 square miles), Jane's said.